DIE Veneris, videlicet, 22 die Julii. Message to the H. C. to proceed against the Lord Mayor. Message from the H. C. with a Letter for Relief of Lord Desmond in Duncannon Fort. His Counsel object to the reading a Deposition taken in another Cause. Counsel admonished, for interrupting the Committee of the H. C. without Leave. The Cause to be proceeded in on Monday and Mr. Wiseman to attend. 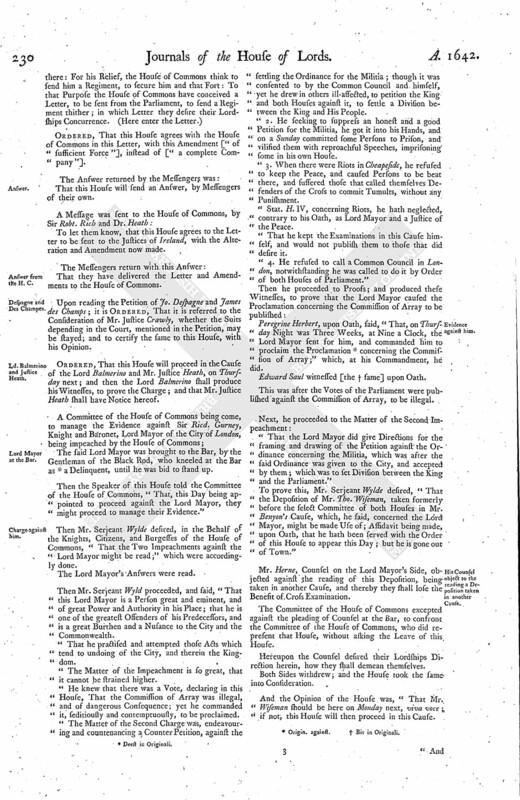 Scots Commissioners desired to present to the National Assembly the Declaration to them, and the Petition of both Houses to the King. The King's Warrant to the Mayor of Boston, to attach Persons who put the Militia in Execution. Order for Indemnity to Mayor, &c. of Boston. To let the House of Commons know, that the Lord Mayor is come; and their Lordships are ready to proceed against him, if the House of Commons are ready. The Lord North is excused for his Absence this Day, being not well. That the House of Commons will send up some Members of their own, to manage the Businesses against the Lord Mayor. Ordered, That this House agrees with the House of Commons in this Letter, with this Amendment ["of sufficient Force"], instead of ["a complete Company"]. To let them know, that this House agrees to the Letter to be sent to the Justices of Ireland, with the Alteration and Amendment now made. That they have delivered the Letter and Amendments to the House of Commons. Upon reading the Petition of Jo. Despagne and James des Champs; it is Ordered, That it is referred to the Consideration of Mr. Justice Crawly, whether the Suits depending in the Court, mentioned in the Petition, may be stayed; and to certify the same to this House, with his Opinion. Ordered, That this House will proceed in the Cause of the Lord Balmerino and Mr. Justice Heath, on Thursday next; and then the Lord Balmerino shall produce his Witnesses, to prove the Charge; and that Mr. Justice Heath shall have Notice hereof. The said Lord Mayor was brought to the Bar, by the Gentleman of the Black Rod, who kneeled at the Bar as (fn. 1) a Delinquent, until he was bid to stand up. Then the Speaker of this House told the Committee of the House of Commons, "That, this Day being appointed to proceed against the Lord Mayor, they might proceed to manage their Evidence." Then Mr. Serjeant Wylde desired, in the Behalf of the Knights, Citizens, and Burgesses of the House of Commons, "That the Two Impeachments against the Lord Mayor might be read;" which were accordingly done. The Lord Mayor's Answer were read. Then Mr. Serjeant Wyld proceeded, and said, "That this Lord Mayor is a Person great and eminent, and of great Power and Authority in his Place; that he is one of the greatest Offenders of his Predecessors, and is a great Burthen and a Nusance to the City and the Commonwealth. That he practised and attempted those Acts which tend to undoing of the City, and therein the Kingdom. The Matter of the Impeachment is so great, that it cannot be strained higher. He knew that there was a Vote, declaring in this House, That the Commission of Array was illegal, and of dangerous Consequence; yet he commanded it, seditiously and contemptuously, to be proclaimed. 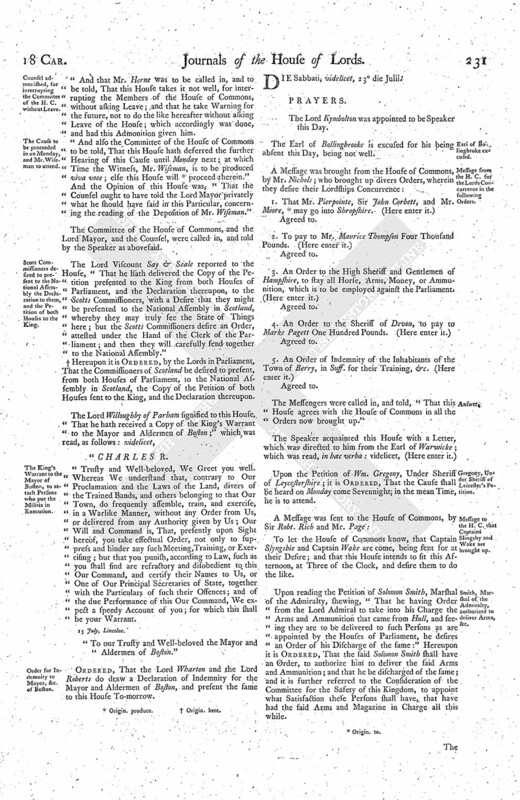 The Matter of the Second Charge was, endeavouring and countenancing a Counter Petition, against the settling the Ordinance for the Militia; though it was consented to by the Common Council and himself, yet he drew in others ill-affected, to petition the King and both Houses against it, to settle a Division between the King and His People. 2. He seeking to suppress an honest and a good Petition for the Militia, he got it into his Hands, and on a Sunday committed some Persons to Prison, and vilified them with reproachful Speeches, imprisoning some in his own House. 3. When there were Riots in Cheapeside, he refused to keep the Peace, and caused Persons to be beat there, and suffered those that called themselves Defenders of the Cross to commit Tumults, without any Punishment. Stat. H. IV, concerning Riots, he hath neglected, contrary to his Oath, as Lord Mayor and a Justice of the Peace. That he kept the Examinations in this Cause himself, and would not publish them to those that did desire it. "4. He refused to call a Common Council in London, notwithstanding he was called to do it by Order of both Houses of Parliament." Peregrine Herbert, upon Oath, said, "That, on Thursday Night was Three Weeks, at Nine a Clock, the Lord Mayor sent for him, and commanded him to proclaim the Proclamation (fn. 2) concerning the Commission of Array;" which, at his Commandment, he did. Edward Saul witnessed [the (fn. 3) same] upon Oath. This was after the Votes of the Parliament were published against the Commission of Array, to be illegal. "That the Lord Mayor did give Directions for the framing and drawing of the Petition against the Ordinance concerning the Militia, which was after the said Ordinance was given to the City, and accepted by them; which was to set Division between the King and the Parliament." "To prove this, Mr. Serjeant Wylde desired, "That the Deposition of Mr. Tho. Wiseman, taken formerly before the select Committee of both Houses in Mr. Benyon's Cause, which, he said, concerned the Lord Mayor, might be made Use of; Affidavit being made, upon Oath, that he hath been served with the Order of this House to appear this Day; but he is gone out of Town." Mr. Herne, Counsel on the Lord Mayor's Side, objected against the reading of this Deposition, being taken in another Cause, and thereby they shall lose the Benefit of Cross Examination. 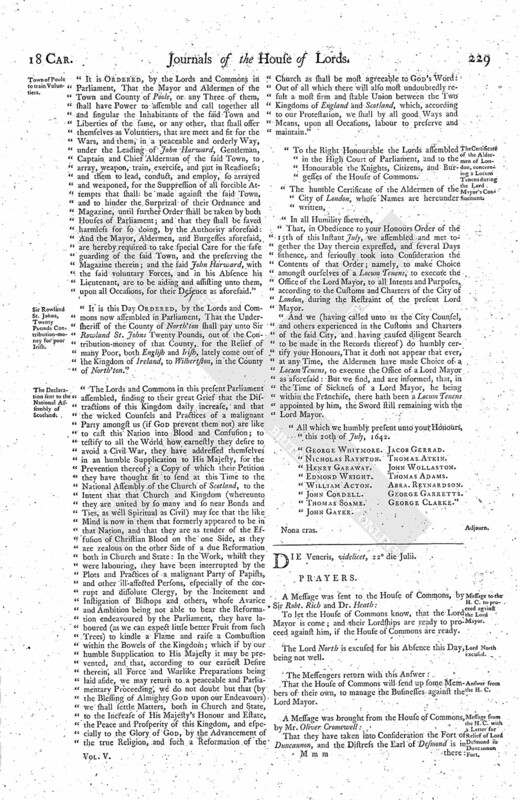 The Committee of the House of Commons excepted against the pleading of Counsel at the Bar, to confront the Committee of the House of Commons, who did represent that House, without asking the Leave of this House. Hereupon the Counsel desired their Lordships Direction herein, how they shall demean themselves. Both Sides withdrew; and the House took the same into Consideration. And the Opinion of the House was, "That Mr. Wiseman should be here on Monday next, viva voce; if not, this House will then proceed in this Cause. And that Mr. Herne was to be called in, and to be told, That this House takes it not well, for interrupting the Members of the House of Commons, without asking Leave; and that he take Warning for the future, not to do the like hereafter without asking Leave of the House; which accordingly was done, and had this Admonition given him. And also the Committee of the House of Commons to be told, That this House hath deferred the further Hearing of this Cause until Monday next; at which Time the Witness, Mr. Wiseman, is to be produced viva voce; else this House will (fn. 4) proceed therein." And the Opinion of this House was, "That the Counsel ought to have told the Lord Mayor privately what he should have said in this Particular, concerning the reading of the Deposition of Mr. Wiseman." The Committee of the House of Commons, and the Lord Mayor, and the Counsel, were called in, and told by the Speaker as abovesaid. The Lord Viscount Say & Seale reported to the House, "That he hath delivered the Copy of the Petition presented to the King from both Houses of Parliament, and the Declaration thereupon, to the Scotts Commissioners, with a Desire that they might be presented to the National Assembly in Scotland, whereby they may truly see the State of Things here; but the Scotts Commissioners desire an Order, attested under the Hand of the Clerk of the Parliament; and then they will carefully send together to the National Assembly." (fn. 5) Hereupon it is Ordered, by the Lords in Parliament, That the Commissioners of Scotland be desired to present, from both Houses of Parliament, to the National Assembly in Scotland, the Copy of the Petition of both Houses sent to the King, and the Declaration thereupon. Trusty and Well-beloved, We Greet you well. Whereas We understand that, contrary to Our Proclamation and the Laws of the Land, divers of the Trained Bands, and others belonging to that Our Town, do frequently assemble, train, and exercise, in a Warlike Manner, without any Order from Us, or delivered from any Authority given by Us; Our Will and Command is, That, presently upon Sight hereof, you take effectual Order, not only to suppress and hinder any such Meeting, Training, or Exercising; but that you punish, according to Law, such as you shall find are refractory and disobedient to this Our Command, and certify their Names to Us, or One of Our Principal Secretaries of State, together with the Particulars of such their Offences; and of the due Performance of this Our Command, We expect a speedy Account of you; for which this shall be your Warrant. "To our Trusty and Well-beloved the Mayor and Aldermen of Boston." Ordered, That the Lord Wharton and the Lord Roberts do draw a Declaration of Indemnity for the Mayor and Aldermen of Boston, and present the same to this House To-morrow.